A timely proliferation of cleaning and disinfecting tools helps food and beverage companies raise their games in preventing food-safety risks. 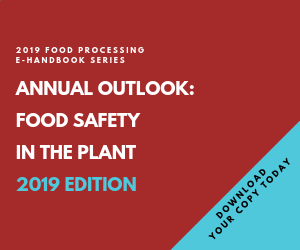 Of all the changes ushered in by the Food Safety Modernization Act (FSMA), few created as much uncertainty as the sanitary transportation rule. Whether they use a common carrier, regional distributor or their own trucks, manufacturers of refrigerated and frozen foods faced an April 6 compliance deadline for the Sanitary Transportation of Human and Animal Food Rule. Besides worker training and documentation requirements, companies must validate the effectiveness of cleaning and sanitation procedures for the reefers that move perishables. Refrigeration units are notorious breeding grounds for microbes, which thrive on warm coils and moisture-laden components. Thoroughly cleaning and sanitizing the trailer cube and the reefer unit typically take an hour or longer, depending upon the size of the truck. Sanitization standbys like chlorine and quaternary ammonium compounds usually are used, along with copious amounts of water. Up to 40 gallons of water serve as a carrier, in which case “you’re basically building an incubator” for microbial growth, points out Tom Myers, executive vice president-technical services for Pure Bioscience (www.purebio.com), an El Cajon, Calif., supplier of silver dihydrogen citrate sanitizers. Some trucking firms try to compress sanitation cycles with power washing, “but it’s a lick and a promise” approach, he adds. Disinfection of food-contact surfaces and spiral freezers was Pure Bioscience’s focus after its eponymous product became the first EPA-approved disinfectant in more than 30 years. In recent years it introduced an environmental misting system for in-plant use. A more mobile version of the mister is a key part of the sanitary trailer system, which includes a foam surfactant with only 5 percent moisture. After removing any debris and applying the foam, the portable mister is placed in a trailer with doors either open or closed and the refrigeration unit on. Instead of a fogging machine, which typically produces 60-100 micron particles, the misting nozzles produce 15 micron particles that are sucked through the reefer unit at high velocity and reach every crevice in the interior. In trials against a conventional truck-cleaning process involving two quat applications, the misting system shrank the cleaning cycle to 15 minutes vs. 2 hours. “When you factor in the labor savings, water savings and reduced chemistry, we’re a net cost saving to the user,” maintains Myers. Some food processors and distributors apparently agree: Several are implementing the system, with two adopting it as standard operating procedure. A sanitation worker applies a pressure hose to bakery equipment as part of the cleaning process. Equipment designed for easier cleaning can speed the process considerably. Photo: Packers Sanitation Services Inc.
Quat and chlorine are the primary chemistries Myers referenced. Add to them peroxyacetic acid, or PAA, which is experiencing growing acceptance, particularly in clean-in-place applications, to the cleaning and sanitation arsenal, and you have described the agents of choice at many food and beverage facilities. “Chlorine and quat have been around forever, and for a number of companies, they are tried and true,” acknowledges Matt Prine, food safety director at Packers Chemical, sister company of Packers Sanitation Services Inc. (redefinecleanpssi.com), both based in Kieler, Wis. (the name references the meatpacking business that also inspired the identity of the state’s NFL franchise). But environmental concerns and the growth of organic foods is driving a shift toward alternative cleaners, particularly PAA. “It’s popularity and usage is growing exponentially,” notes Prine. Alternative sanitizers also are getting a boost from FSMA’s emphasis on environmental monitoring. Pure Bioscience’s misting system also can be applied to processing rooms and other areas inside a plant. Another alternative is fogging units that aerate ozonated water, one of the most powerful oxidizers. Gaseous ozone for atmospheric treatment complements the aqueous form for surface treatment and direct product contact offered by Tristrata Group (tristratagroup.com), Bainbridge Island, Wash. Formerly known as Universal Ozone, Tristrata limits the amount of ozone for aerated delivery to 50 parts per billion (ppb), half the allowable limit set by OSHA for human exposure. Isolated use of ozone as a disinfectant in food plants began in 1997, and FDA’s approval in 2001 for its use in direct food contact appeared to greenlight its adoption as part of the sanitation arsenal. Wide adoption didn’t occur, however, in part because of inadequate controls. Pool supply companies were happy to sell an ozone generator, but companies were on their own when it came to controlling water temperature, pressure, ozone concentration and other variables. “The box is a small piece of a successful ozone program,” points out Mark Dennis, an application expert with Tristrata. Staff training, data logging and other issues also have to be addressed, but a fundamental requirement is that the generator is operating as expected. To ensure it is, Tristrata leases the equipment and assumes responsibility for maintaining it. Tristrata created a web platform five years ago to monitor system performance. It has since evolved into an Internet of Things application, giving food manufacturers access to all performance data and notifications when drifts occur in performance variables. Temperature and concentration are key factors in all types of cleaning. Time and mechanical force also are factors, particularly in manual cleaning. The type of soil and its prevalence dictate tool selection, as does the operating environment. Color coding of brooms and other cleaning tools is common with 5S programs, and the practice is likely to become more widespread under FSMA preventive controls rules. Soft bristles that won’t scratch machine surfaces are appropriate for removing powder in a dry environment, according to Amit Kheradia, education and technical support manager at Zionsville, Ind.-based Remco Products (remcoproducts.com), while a long-handled tool with hard bristles is best suited for heavy buildups of starch and grease. Color coding of cleaning tools is part of any 5S program, and the training clause in 21 CFR 117 under FSMA specifically addresses color coding, Kheradia adds. While color coded brooms, mops and other cleaning tools remain best practices, he raises the specter of it becoming mandatory at some point. Cross contamination concerns with allergens and food pathogens are raising the bar on the cleanability of the tools themselves. Kheradia cites a study in which 47 percent of drain swabs that indicated the presence of Listeria were attributed to the cleaning tools. Remco’s top-end cleaning tools feature bristles that are molded into the brush, rather than stapled into a drilled hole that can serve as a harborage point. Nine color options are offered by the firm. More automation means more electronics in production facilities, posing new challenges for sanitation. Vacuum systems can address the cleaning part of the equation, but water-based chemicals and other antimicrobials often are nonstarters around packaging machines and other automated equipment. In confined spaces or sealed-off areas, chlorine dioxide gas is an extremely oxidative agent. It’s also extremely dangerous to human health, which is why OSHA sets a 0.3 parts per million (ppm) limit for short-term exposure and 0.1 ppm over an eight-hour shift. Concentrations in the 30-40 ppm range are typical for effective sanitizing. Given the need to tightly control the gas, a ClO2 generator may not be the best solution for in-plant sanitation. Bensenville, Ill.-based Pureline (www.pureline.com) created water-activated pucks that release a limited amount of gas, giving workers time to vacate a sealed-off area before the ClO2 does its work. The firm works almost exclusively with food companies. At the request of Kraft Heinz, Pureline developed a miniature puck with 2g of dry chemical that can be placed inside an electrical panel. Regardless of the chemical or disinfecting agent used, boots on the ground dictate how effective a cleaning and sanitizing program will be. PSSI distinguishes Packers from other chemical suppliers because it serves as the outsourced provider of those boots. Soap and water are necessary ingredients for plant cleaning, though sanitation specialists try to minimize the amount of water used to deprive microorganisms of a basic building block of growth. Photo: Packers Sanitation Services Inc.
“We lean on our chemical suppliers to recommend the best options” of cleaning and sanitizing agents, allows Jake Watts, PSSI’s vice president-food safety. How those agents are applied, on the other hand, is PSSI’s area of expertise, and that is determined by the type of processing. “The drier the environment, the better,” he observes, and wipe-down and vacuum play prominent roles in a plant processing dry ingredients. High-pressure washdown is the rule in meat and poultry, but those facilities are beginning to migrate to high volume, low-pressure washdown to reduce the likelihood of atomized bacteria. Approximately 300 different types of quat compounds alone are used in the food industry. More stringent validation of the lethality of quat and other chemicals is being required by EPA, which has shifted to organic serum validation from in-tube testing. Whether a company sticks with tried and true cleaners and sanitizers or tries new options like dry ice or superheated dry steam, these foundational good manufacturing practices represent the first line in a preventive control program. Hot Mama’s was on a strong growth trajectory for its private label humus, salsa and dips.